EgyptAir Flight MS804 heading from Paris to Cairo disappeared from radar with 66 people on board. 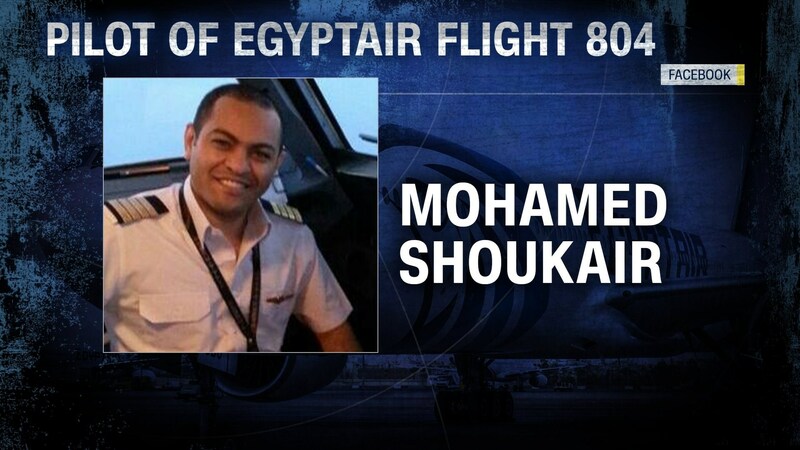 The plane was flying at 37,000 feet when it disappeared shortly after entering Egyptian airspace. No distress calls came from the plane. – Flight 804 left Paris’ Charles de Gaulle Airport at 11:09 p.m. local time and was supposed to land in Cairo at 3.15 a.m. Thursday. Both the departure and arrival cities are in the same time zone. — It vanished 10 miles into Egyptian airspace, the airline said. –The plane’s captain had 6,000 flying hours while the first officer had 4,000, Adel said. –The Egyptian navy is conducting search and rescue operations in the area it vanished, CNN’s Ian Lee said from Cairo. Armed forces are searching the area 40 miles north of Egyptian coastline. 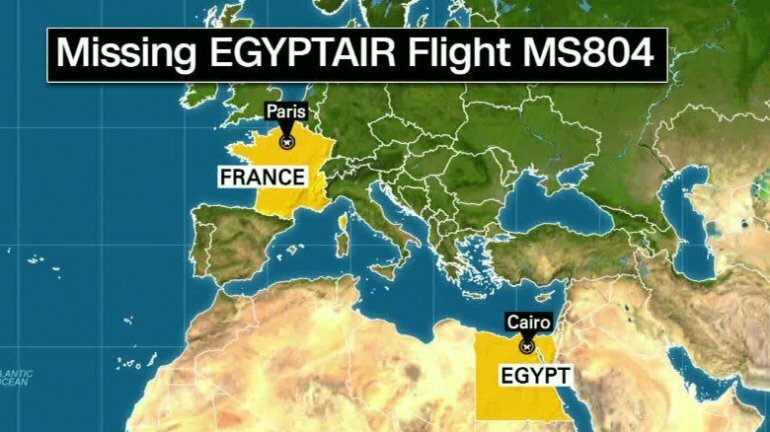 If it entered Egypt airspace and did not report in, that’s highly significant, CNN aviation analyst Mary Schiavo said. “Since they were 10 miles into Egypt airspace, they should have reported in. If anything had been going on they would have reported at that time,” she said. UPDATE 1: Plane’s distress beacon has been picked up, indicating that the plane has crashed in the water. Witnesses in the area say they saw a large fire in the sky. Was the crash of EgyptAir MS408 the result of a Muslim terrorist bomb on the plane? Despite all the media and muslim hoping and praying that it wasn’t, it’s looking more and more like it was. Did the Islamic State (ISIS) Muslim terrorists down the EgyptAir MS408 jet? French intelligence warned of Islamic State plot just days ago. UK Express It has now emerged France’s head of intelligence had earlier warned that the country was being specifically targeted by ISIS. Patrick Calvar, head of the DGSI intelligence agency, told of a “new form of attack” as recently as May 10. The A320 jet disappeared from radar screens early this morning with 66 people on board after taking off from Paris – 15 French citizens are among the passenger list. But it has now emerged France’s head of intelligence had earlier warned that the country was being specifically targeted by ISIS. Patrick Calvar, head of the DGSI intelligence agency, told of a “new form of attack” as recently as May 10. 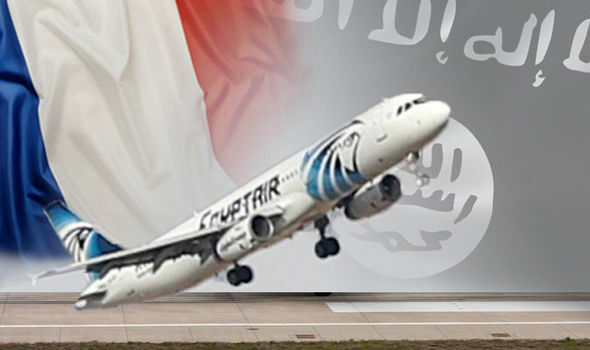 The barbaric Islamic terror organization has previously claimed responsibility for similar atrocities, including the downing of a Russian Metrojet airliner which was downed shortly after take off from Egypt’s Sharm el-Sheikh airport last October. That attack, which was blamed on a bomb smuggled on board by an ISIS operative working at the resort’s airport, left 224 people dead. The terror group used an improvised explosive device hidden inside a Schweppes soft drink can. 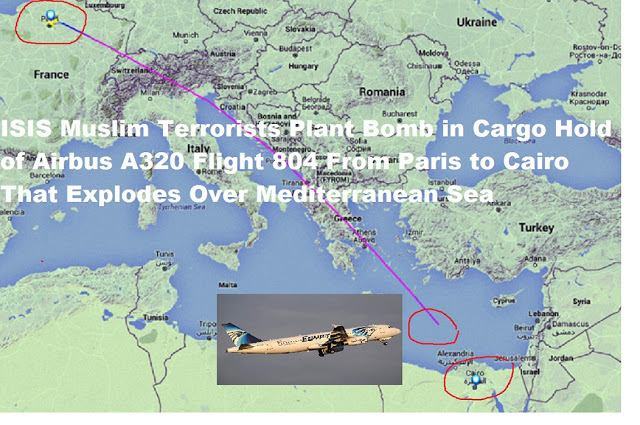 Did Muslim Baggage Handlers Plant Bomb in Cargo Hold at Charles de Gaulle Airport of Airbus A320 Flight 804 From Paris to Cairo? According to Private Investigator Bill Warner, on December 15th, 2015, at least 70 staff working in the high-security areas of Paris airports have had their passes revoked because of suspected radicalization. Since the terror attacks that killed 130 people in the French capital last month and ISIS’ downing of a Russian passenger jet, employees have been under increased scrutiny. The Aeroports de Paris (ADP) group told CNBC that all 70 staff to have security access revoked worked at Charles de Gaulle Airport, the largest in France, and were from subcontracted companies. A suspected terror cell linked to the Paris attackers were allegedly planning an attack on Charles de Gaulle airport and Paris’ financial district of La Defense. 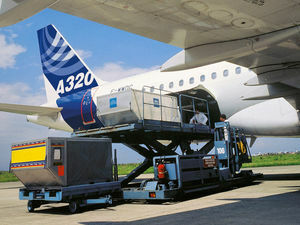 Baggage and freight on a Airbus 320 goes in back near the tail, a bomb placed in this cargo hold would blow off the tail and cause the plane to spin erratically from side to side and then down. Advantages of the A320 Family’s wide fuselage extend below the passenger cabin into the underfloor cargo holds – which are wider and deeper than any other single-aisle aircraft. Access to the underfloor holds is by large doors that open outward to avoid reducing available volume inside the hold. These doors give protection during operations in bad weather, helping to reduce damage to baggage and freight. Inside the cargo holds, baggage handlers appreciate the greater working height and a wider area of flat floor. UK Daily Mail Greek defence minister Panos Kammenos said the Airbus A320 made ‘sudden swerves’ in mid-air, lurching 90 degrees to the left then 360 degrees to the right. It then dropped from 37,000 feet to 15,000ft before the signal was lost at around 10,000 feet. 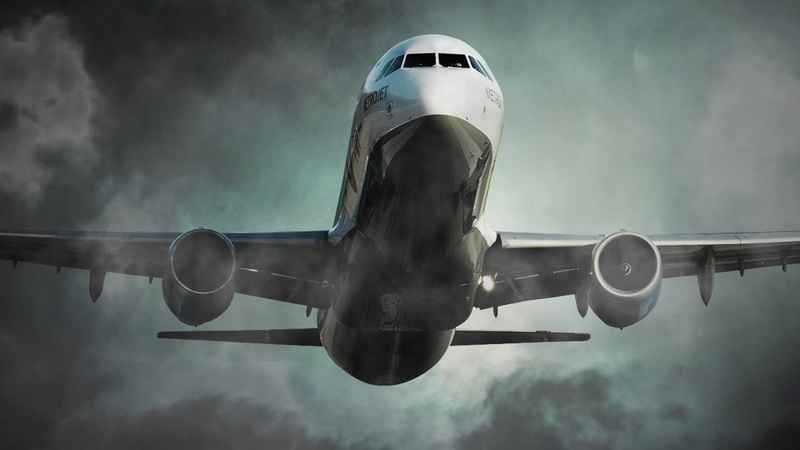 The revelation came as security experts, ministers and former air accident investigators said all the evidence pointed to the plane being targeted in a terrorist attack. Sadly, if confirmed, the disaster would deal another hammer blow to Egypt’s crippled tourism industry just months after a Russian Metrojet plane was brought down in the Sinai peninsula by a bomb planted at Sharm el-Sheikh airport. — U.S. government officials are working on an initial theory the jet was downed by a bomb, two U.S. officials told CNN, although they cautioned that hypothesis could change. — Egyptian Civil Aviation Minister Sherif Fathi also said the possibility of a terror attack was a ‘stronger’ possibility than technical failure. — The head of Russia’s top domestic security agency, Alexander Bortnikov, also claimed it was ‘in all likelihood it was a terror attack’. Their comments came after a merchant ship captain reported seeing a ‘flame in the sky’ over the Mediterranean. 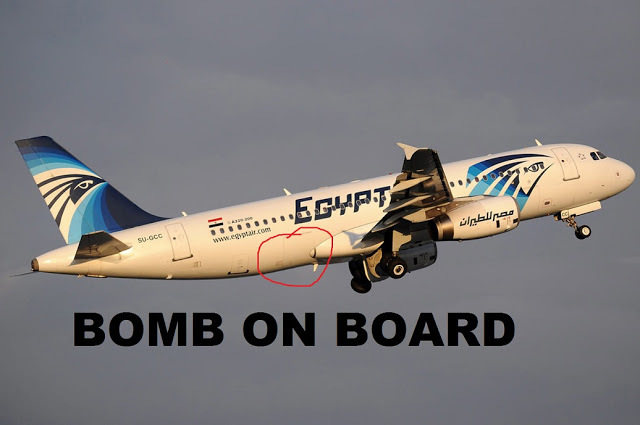 Gateway Pundit (h/t RRA) Official Islamic State news agency Amaq reportedly released statement that says its fighters put bomb on Egypt Airbus that was headed from Paris to Cairo in Egypt. Celebrations were reported in Raqqa, defacto of the brutal militia. Reports just reaching us from the Islamic that an Iraqi passenger detonated bomb inside Egypt Airbus killing all 66 on board, according to Islamic State media. 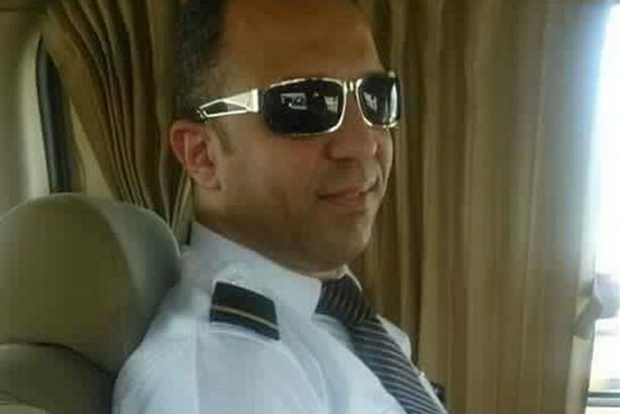 More evidence from the Arabic media is arising to show that the pilot of Flight 804 might have committed suicide. He converted the plane into a makeshift mosque, used the equipment to tell passengers the direction of Mecca, had a last supper and said “farewell” as if ‘we who are about to die salute you.’ He called his brother before take-off telling him to ‘pray for him’ as he was going for martyrdom. He had connections with one of the most radical preachers and terror supporters in Egypt. This was from Al-Hurra News which titled its article “The Call Of Death Embrace The Pilot Of The Egyptian Plane During His Last Supper”. Was this a civilian plane or a makeshift mosque with the pilot as its Imam? In the Middle East, some in the media are even arguing why Shakeer “did not commit suicide”. Why such arguments? Because the question is arising that a possibility of suicide is the rational conclusion. Several articles dispute the ‘suicide theory’ saying that he purchased a plot of land as if purchasing a plot meant that Shakeer had plans for a future. “My brother Mohammed [the pilot] called me before he took off on that fateful day and asked me to pray for him and I do consider him a martyr“. Have at it. Examine the links provided here for yourself using Google Translate. Go ahead, refute, dispute, make my day. The statements are all accurate. And there are more weird coincidences. The flight attendant aboard the EgyptAir jet that crashed while traveling from Paris to Cairo posted an ominous image of a plane plunging into the ocean soon after she started the job. Why? 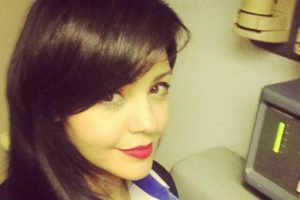 Samar Ezz Eldin (Ezz Eldin means The Glory of Islam), 27, put the shot on Facebook in September 2014 — about four months after she landed a gig at the Egyptian airline, the Daily Mail reported. The image shows a flight attendant walking though water in her drenched uniform as a jet crashes into the sea behind her. Consider that one a joke and it may be. But Shakeer’s link to Amr Khaled should raise some serious alarm bells. The latter is a well known Muslim Brotherhood operative and an active Jihadi who openly aided and abetted terrorists. He shares his friendship with the pilot Shakeer with old photos on that very flight with the same captain of the crashed Egyptian flight 804. 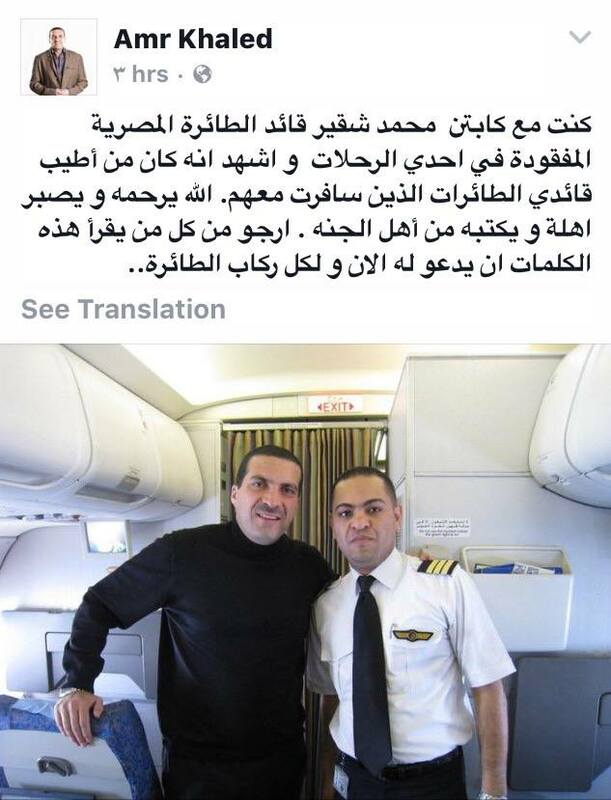 Amr Khaled says in the photo: “I was with Captain Mohammed Ahmad Shakeer in the plane that is missing in one of my journeys. He is the kindest of pilots whom I travelled with. May Allah have mercy on him and give patience to his family. I hope who reads my words to pray for him and the rest of the passenger”. Shakir poses with infamous Muslim Brotherhood jihadist Amr Khaled, who was involved in the Benghazi terrorist attacks that killed four Americans. Its too bad Kaheld was not on that flight. But this ‘connection’ spells trouble for one major reason. Khaled flew with Shakeer several times and was his friend. But who Amr Khaled is should raise an eyebrow, in fact a million eyebrows. In the below video, it is almost identical message “we have sent aid to you in Benghazi, we will aid you… pray for you …” with the youth saying “Amen”. Or they could have been struggling with someone trying to take control of the plane. “It could have been a fight in the flight deck between crew members, one suicidal and one not. Or a hijacker trying to gain access,” Baum said. To have a pilot linked to this Jihadi, have a last supper, be called ‘martyr’ declare ‘I am dying’ should sound alarm bells from Egypt to Washington. The passenger list and the crew should be further examined. 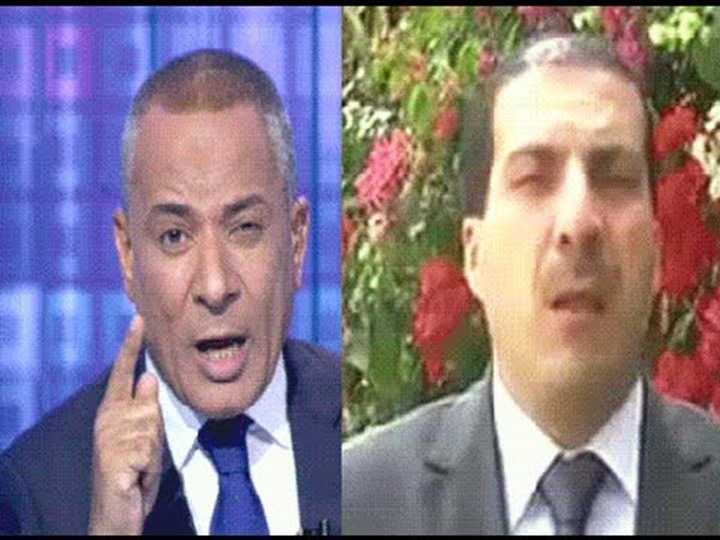 Egyptian political commentator Nabih Al-Wahsh accused Israel of downing EgyptAir Flight 804, and called for Egyptians and Arabs to kill any Israeli they come across and to mutilate the body. Al-Wahsh also demanded the establishment of “death squads” that would hunt down Israelis all over the world. 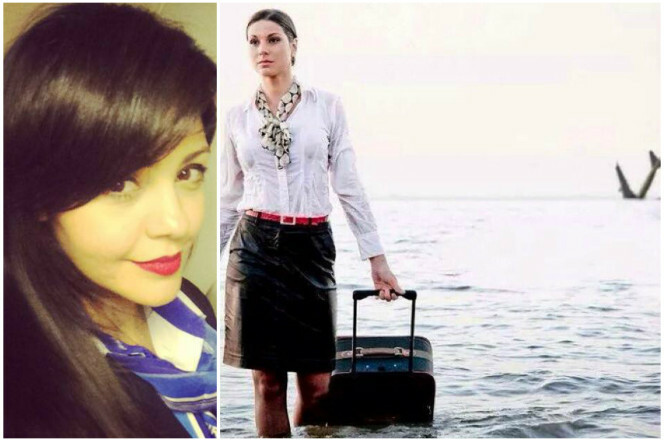 Why would an EgyptAir flight attendant post a picture of a flight attendant walking away from a plane crash in the water? Did Samar Ezz Eldin (right) know something in advance? Seems odd that someone who flies for a living would post a photo like that on her Facebook profile page over a year ago…especially as she was on the doomed EgyptAir flight. METRO UK (h/t Dave J) A flight attendant on the tragic EgyptAir flight MS804 had posted a picture of a plane crashing, months after she got a job with the airline. 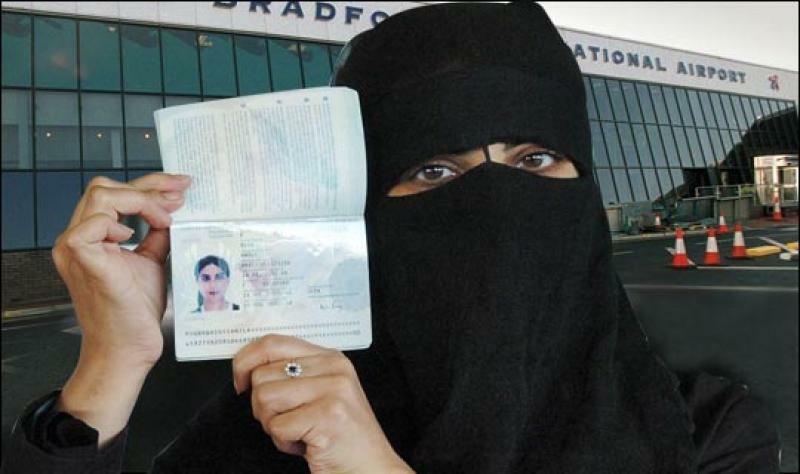 Samar Ezz Eldin, 27, uploaded the haunting image onto Facebook back in September 2014. It shows a female flight attendant in wet clothes pulling a suitcase out of the water as a plane plunges into the sea behind her. 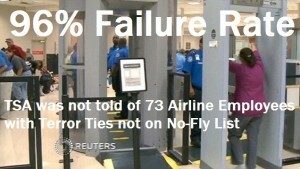 TSA Administrator Peter Neffenger said that only 2 of 73 aviation employees with access to secured areas of U.S. airports who were also on the TIDE (Terrorist Identities Datamart Environment) system – the government’s database of information on international terrorist identities – had their credentials removed, while the other 71 were “scrubbed” from the database on the advice of the FBI, but are still working at the airport. CNS News (h/t Mike F) A DHS Office of Inspector General report titled, “TSA Can Improve Aviation Worker Vetting,” and dated June 4, 2015 said, “our testing showed that TSA did not identify 73 individuals with terrorism-related category codes because TSA is not authorized to receive all terrorism-related information under current interagency watchlisting policy,” the OIG report found. So, in other words, two had their credentials revoked while the remaining 71 in the TIDE database have actually been scrubbed from the database on the advice of the FBI. But they weren’t fired which means, they are still working in the airport and likely have friends with credentials.